Tamluk Rajbati complex has a wide courtyard inside which are on all sides except in the frontal portion where the building is located. The left and right wing parts are double storied barrack like formation while left hand side is in ruins. Facing the front is the massive main structure which has wide pillared openings culminating in arches resembling Islamic architecture. 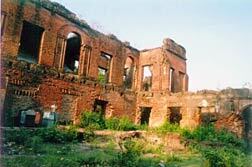 The entire structural complex is made of brick and is in a totally distressed state.